Take a break from the city and head to Cheile Turzii - Turda Gorge and Tarnița. Hazsongard Cemetery and St. Michael's Church will appeal to history buffs. Step out of Cluj-Napoca with an excursion to Muzeul de Istorie Turda in Turda--about 40 minutes away. Spend the 18th (Sun) exploring nature at National Ethnographic Park. And it doesn't end there: take in the spiritual surroundings of Reformed Church of Cluj-Napoca, examine the collection at Zoology Museum, explore and take pictures at Sala Polivalenta, and stop by Chic Bijoux Gallery. To see photos, where to stay, reviews, and other tourist information, read Cluj-Napoca visit planner. Newcastle upon Tyne, UK to Cluj-Napoca is an approximately 6-hour combination of train, bus, and flight. You can also fly; or do a combination of train and flight. Traveling from Newcastle upon Tyne to Cluj-Napoca, you'll lose 2 hours due to the time zone difference. Traveling from Newcastle upon Tyne in August, things will get a bit warmer in Cluj-Napoca: highs are around 32°C and lows about 16°C. Finish up your sightseeing early on the 19th (Mon) so you can go by car to Sighisoara. Discover out-of-the-way places like Cetatea Rupea and Fortified Evangelical Church of Cincsor. Your cultural itinerary includes sights like Fagaras Fortress and The Spoonman. Venture out of the city with trips to The Fortified Church of Biertan (in Biertan) and Izvoare (Icelandic Horses Riding Ranch & Ivo Wildlife Park). There's still lots to do: appreciate the extensive heritage of Sighisoara Historic Center, don't miss a visit to Clock Tower, snap pictures at Scara Acoperita-Covered Stairway, and shop like a local with Art & Crafts. To see where to stay, reviews, and more tourist information, read our Sighisoara trip planner. Traveling by car from Cluj-Napoca to Sighisoara takes 3 hours. Alternatively, you can take a bus; or take a train. August in Sighisoara sees daily highs of 34°C and lows of 15°C at night. Wrap up your sightseeing on the 22nd (Thu) to allow time to drive to Brasov. Discover out-of-the-way places like Prima Scoala Romaneasca and Peasant Fortified Church at Prejmer. Take a break from the city and head to La Prapastii Zarnesti and Mount Tampa. 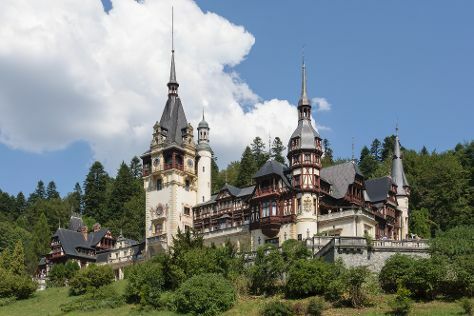 Change things up with these side-trips from Brasov: Sinaia (Sinaia Monastery, Peles Castle, & more), Bran Castle (Dracula's Castle) (in Bran) and Dino Parc (in Rasnov). The adventure continues: contemplate in the serene atmosphere at Black Church (Biserica Neagra), steep yourself in history at Yekaterina's Gate, get in on the family fun at Parc Aventura Brasov, and don't miss a visit to Council Square. For reviews, more things to do, and more tourist information, read Brasov route app . You can drive from Sighisoara to Brasov in 2 hours. Alternatively, you can take a bus; or take a train. Cap off your sightseeing on the 26th (Mon) early enough to catcht the bus to Sibiu. Get outdoors at Transfagarasan Highway and Moldoveanu Peak. You'll discover tucked-away gems like Monastero di Cozia and Catedrala Reintregirii Neamului (Coronation Cathedral). Change things up with these side-trips from Sibiu: Biserica Horezu (in Horezu) and Alba Iulia (St Michael's Roman Catholic Cathedral, Citadel of Alba Iulia, & more). Next up on the itinerary: appreciate the extensive heritage of Old Town, take a stroll through Passage of Stairs, and see the interesting displays at ASTRA Museum. For where to stay, ratings, traveler tips, and tourist information, go to the Sibiu day trip website . Traveling by bus from Brasov to Sibiu takes 2 hours. Alternatively, you can drive; or take a train. In August, daily temperatures in Sibiu can reach 33°C, while at night they dip to 16°C. Finish your sightseeing early on the 30th (Fri) to allow enough time to travel back home.